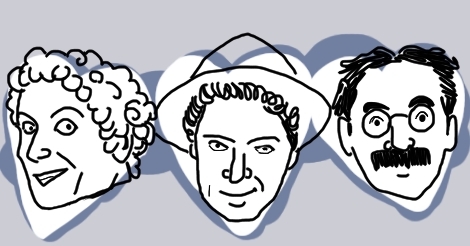 This is Part 2 of our Marx Brothers for the Uninitiated series. In the first part, we introduced the Marx Brothers and their personas, along with their first 5 feature films. You can read Part 1 here. If you read our site often, you may see frequent references to the Marx Brothers. If you have your life going on track and you’re a good person, then you know who they are. However, it has come to our attention that some people know who they are, but have never seen their movies! Even worse, some people just don’t know who they are. So here, friends, is an introduction to the Brothers Marx (part 2). These intros will not tell you much about the movie specifics, because you need to watch them. These movies are not about plot or character, they are about The Marx Brothers. Since they made so many wonderful films, this is part two of your introduction for the uninitiated. We will look at the Marx Brothers in general, and their first feature films made sans Zeppo. I have included clips of them all! When the Marx Brothers ended their contract with Paramount, Zeppo and Gummo became world-class agents. They even represented Jack Benny! The other three brothers tried some radio work, before meeting Irving Thalberg. Thalberg led them to make two of their best-produced films to wide acclaim under MGM, before dying abruptly during the filming of A Day at the Races. All movies from now only include Groucho, Chico, and Harpo, back and ready for action. Zeppo focused on being a superstar agent rather than gracing us with his tiny, perfect voice. In these later movies, the studios took more care to give the movies some substance, such as plot or story arcs. Who cares, amirite? Anyway, even though the studios tried to make the characters more sympathetic, it didn’t work. Groucho appears darker, more nihilistic. He has more opportunities to shut people down and insult women. It’s almost like he tried really hard to do the opposite of what they wanted. Chico’s personality has leveled out for the most part. However, his extreme fake Italian-ness gets even more extreme. His accent grows thicker and more ridiculous (racist?). But he also does get a little more lovable and a little less infuriating. Harpo is ever more terrifying. Ever more silent. Groucho stars as Otis B. Driftwood in this movie, hoping to help an opera company hire some more famous acts. It obviously all goes awry. Chico plays Fiorello, a manager of one of the singers, while Harpo plays Tomasso. The scene below is one of the greatest and most memorable scenes from the movie, and may even be reminiscent of this Keaton scene. This is my favorite Marx Brothers movie, so bear with me. In this one, Groucho plays Dr. Hugo Z. Hackenbush, a veterinarian. Chico’s character, Tony, invites Hackenbush to be the official sanitarium doctor where he works, at the request of an addle-brained patient who thinks he is a human doctor. The romantic couple in the movie has a fight about a horse that the man bought, Hi-Hat. Hi-Hat is the star of the show, and Stuffy, played by Harpo, is his jockey. What follows is the usual series of hilarious misunderstandings, but now there’s a horse in the mix! Also, while the blackface scene may not be acceptable in 2016, it features Whitey’s Lindy Hoppers, some of the best dancers around back then. The dance scene was even nominated for an Academy Award. The clip below is my absolute favorite scene, which was actually cut from the film. (This was the song I planned to sing to my sister at her veterinary school graduation, but as it turns out, I never learned to sing.) The clip underneath is the fabulous Lindy Hoppers! Be careful, they’re exhausting just to watch! This movie was filmed in what would later become DesiLu studios. And what a coincidence, Lucille Ball is in this one! Ooh la la. This movie was based on an existing play and the parts were not created specifically for the Marx Brothers for once. Many people consider this movie to be the beginning of the end, in regards to the Marx Brothers quality we’ve come to know and love. This gem has drama built right in. It’s at the circus! And even better, you don’t have to pay to watch animals being mistreated. (If you see one there in the back who looks sad, just remember this movie is from 1939.) As usual, the Marx brothers are around to inexplicably help save a dying business. Groucho plays the lawyer J. Cheever Loophole. Chico plays Antonio Pirello and Harpo plays Punchy. Although the song below is amazing, you should definitely watch the movie for Groucho’s fights with a gorilla. Spoiler: at some points, the gorilla turns into an orangutan, due to some wacky Marx hijinx behind the scenes. Come back next month for Part 3! Will it ever end?